[AUTHOR’S NOTE: This article was first published earlier this year in the February/March issue of Gettin’ Out Magazine here in Idaho and is reprinted here with the permission]. Everyone loves a good deal—you know, when you get a great discount, or even better, you get two for the price of one. The same is true for bird hunters. We live for those times when it all comes together, the hunting companions are unbeatable, the weather cooperates, the birds are aplenty, the dog work is phenomenal, and the old shooting eye comes through for once. Memories of those banner days afield only get better with time. 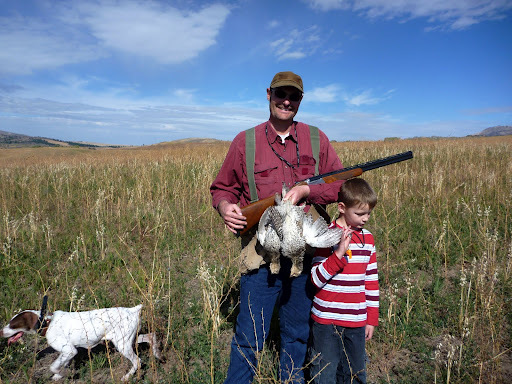 Last October, my brother Shawn and I shared one of the best weeks of bird hunting I have ever experienced, days of hunting blue grouse, quail and huns, sharptail and ruffed grouse. We saw plenty of birds, the dogs did great, and, with the exception of a few brief moments of mediocrity, I shot pretty darn good (for this duffer anyway). How could things get any better? 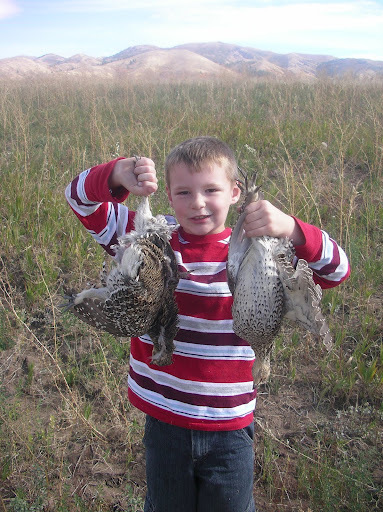 After a phenomenal Thursday hunt for sharptails and ruffs not far from Pocatello, with my brothers, Shawn and Jake, a thought struck me: Kristin (my wife) and the kids are coming back from the dentist in Rupert and she’ll be passing through Pocatello. Why not see if I can spend Friday hunting with my only son, Thomas? 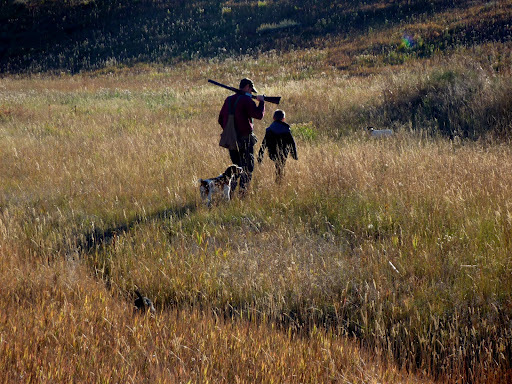 Tommy and I had shared some great days blue grouse hunting in September, but we had not hunted together since then. We were about due for another hunt and I wanted to share part of this unforgettable week with him. “Hi, where are you guys?” I asked Kristin over the phone. “Almost to Pocatello, why?” Kristin responded. “Would Tommy like to skip school tomorrow and go hunting with me?” I asked eagerly. I could overhear Kristin talking to Tom about my proposal on her end. “Yes, Tommy would love that. Let’s meet at the Maverick so Tom can jump in with you.” Kristin suggested. Fifteen minutes later, with a chocolate milk in hand and a smile on his face, Tom climbed into the car with me and the bird dogs. That night, Tom and I had a good laugh together as we watched Diary of a Wimpy Kid at his Grandma and Grandpa Empey’s in Chubbuck. The next morning, we awoke with the sun and stopped for breakfast at the local MacDonald’s with Shawn and his fiancé, Karen, and indeed, we were loving it. Upon reaching our hunting destination, a covert we dubbed the Royal Macnab, I had to make a difficult decision: Should I try and hunt my elderly French Brittany, Sunny Girl, or should I hunt only the energetic pup, Misty? Given the fact that Sunny could hardly walk after a nonstop week of hunting, the answer was obvious. I had to let the old girl rest. As Sunny cried over the betrayal, a tear welled up in my eye over her unquenchable desire to hunt. The spirit was still willing, but the flesh was weak. That little dog is all heart. Once again, Misty is going solo on this day. The Royal Macnab is a special covert any time of the day, but in the morning, with the sun rising over the mountain ridge to the east, the covert literally shines with all of the colors of fall. One can’t help but feel hopeful with such light and beauty all around. With your only son by your side, this makes things even better. The Royal Macnab is basically made up of foothills sloping up to a majestic mountain range to the east. 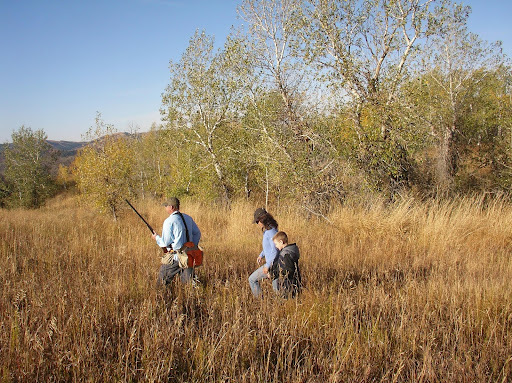 The foothill bench itself is covered with sage brush and CRP. However, as the bench descends to the valley, it is intersected with numerous thickly wooded draws gouged out by the seasonal streams created by rain and runoff. As the streams descend in elevation, the draws steadily deepen and widen into canyons. The sharptails use these geographical features to their advantage and fly across the draws to escape the pursuing hunters. First thing that morning, we stopped by the elderberry knoll overlooking one of the draws to see if the devious ruffed grouse—who had burned me numerous times before—was home, but he was nowhere to be found. Having hunted the same covert the day before, the sharptails were not as readily found either, but, with the abundant successes of the earlier week, the figurative cup of my drive to succeed had been filled to overflowing. The mighty hunters approach the elderberry knoll to see if Mr. Ruff is home. Instead, Tom and I talked about life and the little things of the natural world that kids see, but adults oftentimes overlook, like beetles, grasshoppers, berries, or colorful leaves. Tommy wanted to take pictures of every grasshopper he saw and there were hundreds around. At one point, Tom picked up a perfect little mouse skull and I took pictures as we admired it together. As for birds, Shawn flushed a few Hungarian Partridge and knocked one down, but the dogs could not find it in the thick grass. I marked the other Huns down fairly well and Tommy, Misty, and I worked our way over to where I thought they were. Although they were pretty much where I expected them to be, I still missed the grey streaks of lightning when they flushed, which is the general result for me when encountering Huns. I call this being Hundone. Even with the miss, Tommy and I continued to enjoy each other’s company and talked as we hiked over hill and dale. I was proud of Tommy because he did not complain about the hiking even one time and seemed to really enjoy the time afield. We all decided to swing back towards the vehicles to water the dogs and then try the lower stretch of the Royal Macnab. This was the ticket as the birds were bunched up on this side of the biggest draw on the property. Shawn quickly took a bird that was trying to jump the canyon, but Tom and I followed Misty up a rounded hill as her body language indicated birds. 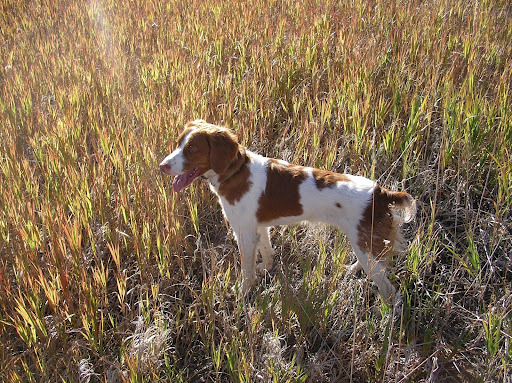 Shawn’s pointer, Geppedo, happened to be closest to us when a big covey of sharptails bailed off the downhill slope of the hill. In a split second, I took aim on the bird closest to me, but saw another one line up with the barrel as I pulled the trigger. To my amazement two birds dropped at the shot—a bona fide Scotch Double. I had never done this before in my life. It was that type of week. Gep retrieved the bird I meant to shoot and I fetched up the other one filling my limit for the day. “Did you see that Tommy Boy? I just took two birds with one shot!” I asked excitedly. After we got back together with Shawn and Karen and started to head back up towards the vehicles, two sharpies flushed away presenting Shawn with a perfect opportunity to fill his two bird limit. 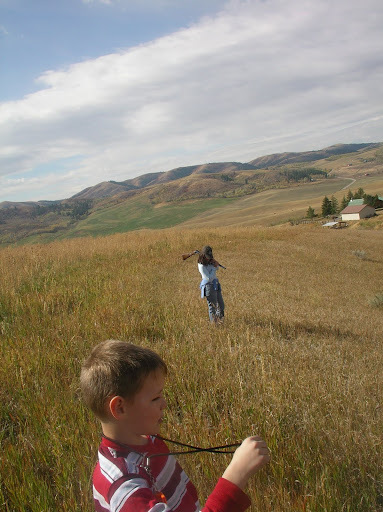 We watched—as if in slow motion—as Shawn pulled the trigger and one bird dropped way down the steep hill. What an excellent shot and what a way to cap off a week of hunting with my brother. Tommy Boy, my good luck charm. As I reflect on this hunt, I have to admit that it is not the spectacular shot that made the day special for me. Oh sure, it was sweet and I won’t soon forget it. Rather, it was the quality time spent with Shawn, Karen, and especially Tommy Boy hunting my favorite covert that really made the day shine. As I always say, the birds are just the bonus. On this day, I definitely got the two for one deal!